One of the world’s most famous and well respected Scotch whiskies, Talisker hails from the Hebridean Island of Skye, which is renowned for its natural beauty. The only distillery on the island, Talisker is typified by a peppery spice, maritime and a warm pungent peat thanks to its terroir. Talisker has a history stretching back nearly 190 years and is a key member of Diageo’s "Classic Malts" range. The water to make Talisker’s iconic peaty whisky is drawn from no less than 21 springs found in the hills that surround the distillery. Mineralic and soft, with a delicious peaty tang, this water is reflective of the final Talisker spirit. The local stream- the Carbost Burn- delivers water for a traditional element of the Talisker distilling process: the five wooden worm tubs found outside the still house. This results in a "partial triple distillation", with spirit from the stills cooling before reaching the condenser, and returning back to the process within the stills. Talisker believe this results in a fuller, sweeter flavour. Indeed, the distillery did practice triple distillation until 1928. This is not the only quirk that the distillery has in its equipment: U-shaped lye pipes at the top of the stills performs a similar role to the worm tubs, returning spirit to the stills as it cools early, before reaching the condenser. The distillery has survived devastating fires, local clergy protestations, prohibition and financial crash to become one of the most esteemed distilleries around. Indeed, it attracted the praises of a one Robert Louise Stevenson, who remarked in his poem ‘The Scotsman’s Return From Abroad’: "The king o' drinks, as I conceive it, Talisker, Islay, or Glenlivet." Drinkers of this fine malt should expect smoky notes of peat, spicy white pepper, briny seawater, and a buttery oily mouthfeel. The distillery is commended by connoisseurs for bottling at the higher strength of 45.8%, consider the "Talisker Classic", which allows the flavours to come through to a greater extent. Talisker House, the ancestral seat of Clan Macleod, is constructed. Brothers Hugh and Kenneth MacAskill arrive from the nearby island of Eigg to farm sheep. After several attempts to found a distillery, they finally succeeded in purchasing the ideal location, with the brothers buying the lease to Talisker House from the Macleods. The brothers displaced local tenants who were living on the Talisker land as part of the wider "Highland Clearances". At the time, the building of a distillery was vehemently protested by the former Minister and member of the Macleod clan, Rev. Roderick Macleod, who stated the distillery was "one of the greatest curses that could befall it or any other place." The lease is passed on to the North of Scotland bank. For a mere £500, Donald MacLennan acquires the distillery from the bank. Though his period in charge was short lived, and he put the distillery up for sale in this year. Having gone bankrupt, MacLellan sells the lease to Glasgow agent John Anderson, whilst retaining a position at the distillery itself. Anderson pronounces that there is not a better whisky on the market"! John Anderson is locked up after being found to be selling casks of whisky that did not exist! The lease is renegotiated with clan Macleod, with the annual payment recorded as "£23.12s and a ten-gallon cask of best-quality Talisker". Kemp sells his half of the distillery and moves to another esteemed operation on the mainland: Macallan. Talisker Distillery Ltd is formed. Kemp’s old partner Allan dies, with the ambitious and forward thinking Thomas Mackenzie, of Glen Ord and Dailuaine distilleries, taking over. Under Mackenzie, the distillery merges with Dailuaine-Glenlivet Distillers (Dailuaine had been founded by Thomas’s father, William Mackenzie) and Imperial Distillers, forming the new company, Dailuaine-Talisker Distillers. By this point, and after the Cognac blight of the late 19th century, Talisker had risen to become one of the best selling whiskies in the country- both in blends and as a single malt. The distillery sits at the heart of a complex, with purpose built tramways, piers for loading and unloading, and cottages to house (in some comfort) the small but expanding workforce. In the midst of the First World War, Talisker changes ownership, after Mackenzie dies. The distillery is bought by a consortium including John Dewar, W.P. Lowrie, John Walker, and Distillers Company Limited. Distillers Company, now Diageo, take full ownership of the distillery. The distillery abandons the interesting practice of triple distillation This is something usually associated with Irish distilling. The Scottish Malt Distillers takes administration of the distillery. Grain shortages during World War Two force the temporary closure of the distillery. Disaster strikes on 22nd November 1960, when a genuine mistake leads to an employee leaving a valve on one of the spirit stills open. At this point the stills remained coal fired, and once the spirit reached boiling point, it spilled over onto the fuelling fires, totally destroying the still house. The distillery was painstakingly rebuilt, with exact copies of the old stills placed at the heart of the new still house. The distillery reopens, merely two years after near total destruction. After over 140 years, the practice of floor malting at the distillery is ended, with malt being brought in from the central maltings at Glen Ord. In this same year the stills are converted to steam heating, ensuring that a fire such as the 1960 instance was unlikely to ever happen again. 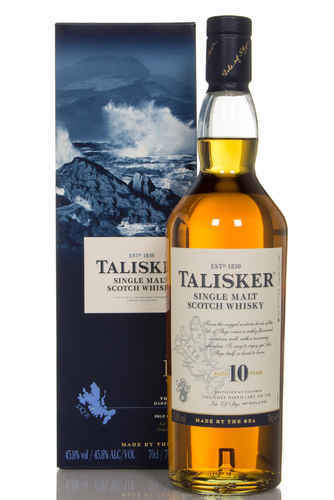 Talisker 10 year old becomes one of the "Classic Malts" series introduced by United Distillers, an ancestor of Diageo. The International Wine and Spirits Competition award Talisker with a trophy for best single malt under 12 years. At the same time, investment is poured into the distillery, with five new wooden worm tubs (a classic Talisker quirk) constructed in addition to a new copper mashtun. The first Distiller’s Edition Talisker is released- an Amoroso finish. 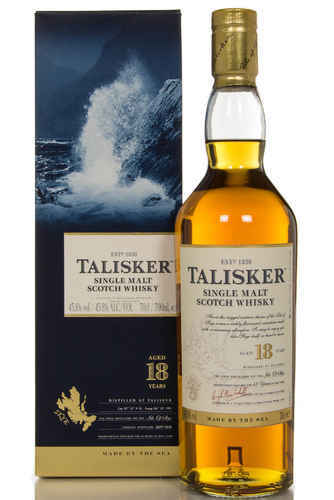 Talisker releases two new additions to its standard line, an 18 year old and a 25 year old. The distillery celebrates 175 years of operation with a special anniversary release. Talisker releases 57o North, a high strength bottling- the first of its kind to be regularly available. In the same year Talisker 18 wins World’s Best Malt Whisky and the installation of two new washbacks increases production. A stellar 34 year old bottling of Talisker is released, whilst Single Cask "Prestige" bottlings also hit the shelves.